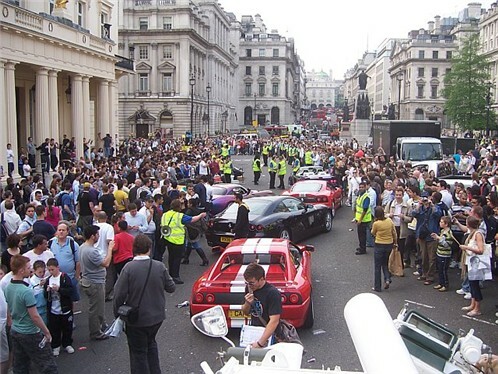 We had a call from a chap called Ajay, from the Gumball rally, would we bring the limo Tank along and ship a few Celebes around London, Piccadilly, Regent Street, etc then park it outside the Troccader night club sat night and Sunday display it at the gumball rally start. I thought best run this by the chaps. In about 30 minutes we had a full team of ten all up for it. Was bound to be a tough one we already had 150 people coming to spring farm in the day and we would have to leave 6,45 at the latest. My only questions that i thought i should ask on behalf of the lads of course were. 3.will their be lots of beautiful models begging to have their photo taken with us on the tank. 4. Will we get hotel. 5. Will we be stunned by the pay? Well 4 out of 5 isn’t bad we all ended up sleeping in the tank would have been rather comfy if not for two of the lads snoring, who shall remain nameless Binkie and Richard .check out the close up pictures i found a camera flash in the eyeballs helped a little. Eddie said i was the best person he had ever slept with. I hope he means im a silent sleeper with nice smelling feet. The Tanklimo went like a train all night the crowd response was remarkable Thousands of camera’s flashing constantly every body desperate for a ride. One of the models called Laura said her ride in the tank was more exiting than the 7 year relationship she had just finished .I was speechless The club was great, met all sorts and Eddie made friends with every one of them, He just hasn’t got an off switch .So for all those who said limo tank couldn’t handle London look at the pictures and weep, And as for the police, pukka chaps one even commented on my driving being better than the cabbies Remember a Tank turns from the middle.